Offshore oil rig jobs are the hot new jobs for this coming decade, bumping IT and finance from their perch. These are some of the jobs in the upstream oil industry, where you look for oil and drill for it. Then there is the midstream, where you refine and transport the oil. Finally, there are the downstream oil jobs, where you sell and distribute the finished product. Upstream is where both the greatest demand and the greatest competition lies. Most of these jobs are international and require a lot of travel. Employees here often work in Alaska, the Arctic, Canada and the Middle East. The people on the really sharp end are the geologists who look for oil and the people who support them, doing seismic testing and test drilling. Should you try to get in here? This is a judgment call. If you started a university degree with the related qualifications 2 to 5 years ago, you would be in a very good position. Many of the oil company staff here would be in their 50s and 60s, some of them recalled from retirement. If you start today, you’ll get your degree in 3 to 5 years time. Demand for a geologist would probably not be as strong. If you have started your geology degree, this is a good time to get the specializations you need to branch into this line of work. 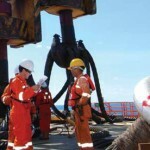 A better choice for someone starting out is to get an offshore oil rig job as a roughneck or roustabout. While you are technically a laborer, your salary is better than many managers (unless they work for a tobacco company). Let your high school peers enjoy their better-sounding titles. You get to laugh all the way to the bank. In addition, if you show the right attitude and skills, you can work your way up the hierarchy from roustabout all the way up to derrickman, driller and oil rig manager. Whether or not you make it to oil rig manager, do remember history. Oil prices will eventually drop again after about 1 decade. Save some of your salary and use it to build your nest egg. Don’t blow all your salary on beer and cigarettes and living the high life. Make sure you can retire when the oil boom ends. Another good choice is to get a good trade skill like electrician, mechanic, medic or cook. 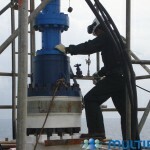 These are some of the support positions also needed on an oil rig. You don’t get labeled as a laborer, but you still get a good salary and excellent benefits. For spending 6 months every year in the middle of nowhere, you get more pay than your peer working on land. It is still a pretty good deal. In addition, when the oil market bubble bursts again, you have your trade skills to get by. 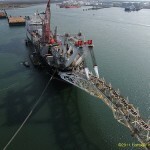 Even without the specialized skills of the driller, you can still get an offshore oil rig job. You can work your way up from roustabout, or you can get in through a tradeskill in a support position.